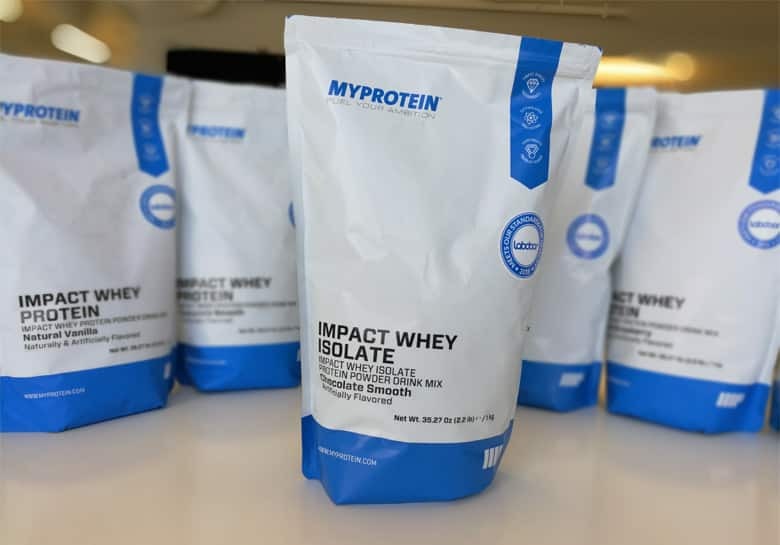 Slickdeals News & Articles Buying Guide MyProtein Review: Which Protein Powder Tastes the Best? MyProtein Review: Which Protein Powder Tastes the Best? Slickdeals staffers try out different flavored protein shakes from MyProtein. Slickdeals content may contain references to products from one or more of our affiliate partners. If you make a purchase on their site through a link on Slickdeals, we receive a small commission. This in no way affects our opinions on products or services mentioned in our content. MyProtein is a familiar brand to many Slickdealers who have deal alerts set for protein powder. We see an average of two MyProtein deals a month make it to either Popular Deals or the Frontpage. With such a good track record on our site, we figured we should sample some of their flavors to see what the good ones are for the next time a deal pops up. * Full disclosure: MyProtein was kind enough to send us over some sample bags at our request so we could conduct our taste test. We don't do a lot of product reviews on the site, but if an opportunity presents itself where we can try out products that we see frequent deals for, we will definitely consider it. MyProtein seems to have a Frontpage deal twice a month, so we know our community likes their products. After looking into their product ratings on Labdoor to make sure they use quality ingredients and that their labels reflect what's in the bag, we reached out to MyProtein to see if they would agree to let us sample some of their flavors. MyProtein have many more flavors available, we just stuck to the flavors they sent us. A reddit user did a more extensive taste test last year and tried out every single flavor available (57, to be exact). You can check out that break-down here. This was never intended to be a scientific analysis of their protein powder; you can head over to labdoor for that. We just wanted to know what some of the different flavors taste like. Are they good or not? That's probably the second most important factor when buying protein powder in bulk, right after ingredient quality. Am I going to be able to chug this once or twice a day without gagging? We enlisted staff members from the Slickdeals Los Angeles office to try the different flavors, all mixed in a shaker with unsweetened almond milk. Some of them are regular consumers of protein shakes, others were not. The interesting thing was that prior experience with protein powders had no impact on whether they liked the flavors or not. You'd imagine a regular consumer of protein shakes has a higher tolerance for what's considered "good" or tolerable, but that wasn't the case. From the first taste test there were three clear favorites among the flavors we tried. Chocolate Smooth was the winner as far as overall flavor profile — everyone enjoyed it. Salted Caramel was also popular, but some felt it was a tad too sweet. That's an easy problem to fix, however. Just add more milk or almond milk and you'll get a less sweet flavor. The Natural Vanilla protein powder was not necessarily a smash hit by itself, but many of us felt like it would be the most versatile flavor to choose. You could easily change up the dominant flavor of your shakes by simply adding different ingredients, like frozen berries or a banana. As far as the least favorite flavor, Natural Strawberry took home that award. It tasted very artificial (duh), and didn't go down easily. The Banana shake had a slightly off-putting color to it and reminded people of a Laffy Taffy candy, but personally I didn't find it that bad. Chocolate Brownie was also not a flavor our taste testers would buy a bag of. The second taste test the results were a lot more mixed, but French Toast and Snickerdoodles are safe bets if you want to try something new. To stay up to date on MyProtein deals, either set a Deal Alert or check out their store page on Slickdeals for all MyProtein coupons and sales. Any product or service prices/offers that appear in this article are accurate at time of publish, and are subject to change without notice. Please verify the actual selling price and offer details on the merchant’s site before making a purchase. Johan Mengesha is the Editorial Director at Slickdeals in Los Angeles, Calif. Mengesha has written for print and online media outlets since 2003 and has a journalism degree from Cal State Northridge. Published work has appeared in the "Los Angeles Daily News," the "Daily Sundial" and eHow.com.